Chassidic singer star, who until recently was called the "bad boy" of Hasidic music - Lipa Schmeltzer came to an interview in the "Comptroller" program, where he talked about his new way, the new album and the compromises he gave. "I always tell people that the next album will be in a style that I have not done yet, and people laugh and say, 'Every time you say that,' and I answer them and I did not keep my promises. Referring to the question of why we should wait for the new album. Lipa relates to the tremendous change that took place in the past year: "A year ago, things were different, in my place and in the market, where I sing and what I do, there have been many changes ... Today I sing more in the ultra-Orthodox, even in modern weddings, but I always say that the modernists do not care that I sing to the ultra- ... "he says with humor. "I said I did not care if I sold or not and the album was more personal, but after that people also asked for hits, hit hits and the album was almost ready to be released. I pushed a few songs that were not in the same concept, and I decided to reopen the album and think about what to put in it, and therefore it is delayed a bit, "says Lipa. The new album involves the processor Yoeli Dickman, producer Naftali Schnitzler and singer Yeedle Werdyger. "There are indeed a lot of cooks on the album, which is a bit dangerous, but in the situation I'm in now I should hear what other people like and listen to my heart and do some combination." "The processor Israel Lam once said that the second disc should be made at least 80 percent better than the first so people will say," It's almost like the first one, "the first one is always refreshing and innovative. And therefore we must constantly move forward. " "If I really wanted to do something completely different, I would not ask anyone and I would do whatever I wanted, and maybe 200 people would say to me," Lipa, we loved what you did. "People want me to bring They have "meat". "It's like something will open in Geula a store with products of Paris that nobody knows, we went for innovations but with nostalgia for what was always an interesting mix," he adds. Asked about the change in the way he says, "This is not a new way, it is an old way from where I originally came." "People ask me if all the change I've undergone is just for the business ... I tell them that what I did before was for the business, but the business did not go ..." he says. "I'm not going to be anything tomorrow from China or Egypt, my public goes with my hat and suit and I go with them." One of the men asked me if I was really wearing a white shirt for heaven's sake, so I asked him: Can you really go with a white shirt? Because tens of thousands of fans feel better than I am dressed exactly like my father and my family and like them, it's really a mitzvah, "he says with a smile. Lipa is known as one of the greatest innovators in Hasidic music. "It's no secret that I start new things a lot, I take the lyrics and others reap." as a bee takes nectar from flowers But it must really be the avenue of Judaism from which we will not move. " "I've been painting for about five years, it's great therapy for me, I jump all the time, and when I draw, it lets me relax and act gently." He says that the next cover is probably seen from the fruit of his paintings. "The art I make connects to music. Sometimes I draw a painting in one copy according to the rhythm and lyrics, and I have a plan to draw songs by other artists, such as Yossi Green, Mordechai Ben David, Udi Davidi, Yishai Ribo and others." "I have a compromise on the subject with something that started to bring me many Hasidic weddings," he says, adding that if I come in a colorful wedding for a wedding, it takes the focus of the bride and groom So I go to weddings like everyone else and try to be part of the wedding and dance in a circle, but I told him that it's hard for me to give up my world, part of my character and make a compromise that on Pesach and Sukkot and on holidays I can wear a colorful one. " "It's important for me not to make fun of rabbis, and I always tell the seller when I choose the colored fabrics that will not give me the same thing as the monktsher and the babobber," he says with a smile and adds humorously. Lipa also reveals that he plans to publish a new album every year. "In the coming years, I plan to publish a CD each year, but in a different concept with unique ideas, even if it is not a hit, I do it for the soul." וועלט'ס מויקאנט "יואלי דיקמאן" שרייבט אונטער פאר בד"ץ עדה החרדית אז ער וועט מער נישט צולאזן קיין פירצות הדת, נאך וואס א כלה האט פאר עטליכע מינוט געפויקט ביי א שמחה וואו ער האט געפירט די מוזיק בענד. אסדר לסעודתא האט געשריבן: וועלט'ס מויקאנט "יואלי דיקמאן" שרייבט אונטער פאר בד"ץ עדה החרדית אז ער וועט מער נישט צולאזן קיין פירצות הדת, נאך וואס א כלה האט פאר עטליכע מינוט געפויקט ביי א שמחה וואו ער האט געפירט די מוזיק בענד. 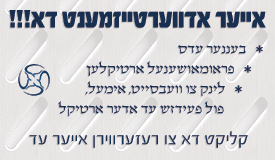 כל הכבוד פאר מר. 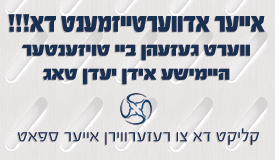 דיקמאן!